Hereford Square is a private communal garden provided for residents of the surrounding houses, part of the Day Estate developed from 1847-52 by architect Thomas Holmes. Benjamin Day had married Ann Dodemead in 1743, whose father had land here, and they built Hereford Lodge (demolished 1840s) on what is now the south-west corner of the square. The central garden was part of the original plan and completed by 1848; it has mature trees, paths, lawn, shrub and flowerbeds. Among famous residents was Sir James Barrie, author of 'Peter Pan' who lived at 133 Gloucester Road. During WWII, the garden was used as baseball ground by American soldiers. 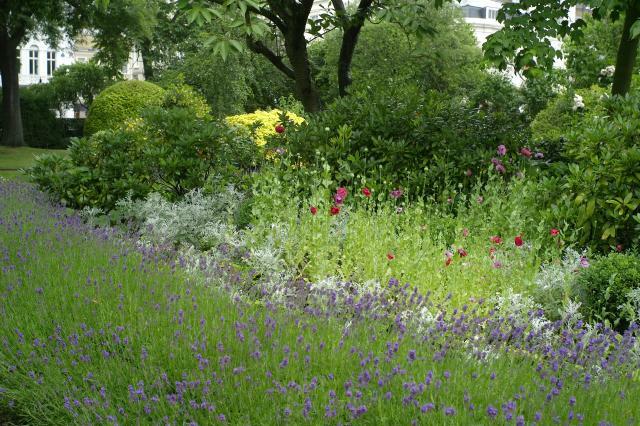 Has taken part in Open Garden Squares Weekend 20 times, most recently in 2018. Hereford Square is part of the Day Estate, which James Day developed from 1847-52; part of the freehold of Hereford Square still remains with the Day family including that of the garden. In 1743 Benjamin Day of Tavistock Street, Covent Garden had married Ann Dodemead, whose father had taken the land later to become Hereford Square. They built Hereford Lodge, demolished c.1840, on the south-west corner of what is now the square and during the C18th other buildings were erected sporadically to the north and west, none of which remain, but which included Brompton Villa and The Rosary, commemorated in nearby Rosary Gardens. In 1845 the family concluded an agreement with builder Thomas Holmes to complete the square within four years and he worked with architect John Blore, who was working on Thurloe Square (q.v.). Hereford Square consisted of three symmetrical Italianate terraces on the north, west and south sides, largely unaltered today although parts were later damaged by WWII bombing. Although Holmes was declared bankrupt in 1847 having built 21 of the planned 36 houses, building continued with loans from various City merchants. The central garden was part of the original plan and was completed by late 1848, with iron railings, at a cost of £1,300. A clause in the original covenant with the Day estate forbade sub-letting and consequently the houses remain largely as family residences, which meant that the garden was much used by young families and their nursemaids. However a few houses were divided into flats as the need for single family houses declined around the time of WWI. In WWII the garden was used as a baseball ground by the many American troops stationed in the neighbourhood. When the south side was destroyed in bombing it was replaced in the 1960s, designed by architect Alexander Flinder. The layout of the communal garden consists of winding paths around the outer edge; in the centre is a circular bed with paths around it (OS 1976); the railings are modern. In 1928 it was maintained by a Garden Committee and paid for out of a rent of £3 per annum payable by the lessees under their leases. Mr H A Day, the then owner, was of the view that 'all such squares should be preserved against building' and he had 'recently agreed to a trust of the tenants being formed, and . . . Offered them a sum of money for the purpose of paying, with the interest, a suitable caretaker during the month of August, when the garden might be thrown open' (Report of the Royal Commission on London Squares, 1928). The garden at that time was described as a 'rectangular area laid out as a very attractive garden with lawns and shrubberies. Trees and shrubs around the border'. Protected under 1851 Garden Square Act and the 1906 London Squares and Enclosures (Preservation) Act. Among the famous people who lived here were Frederick Hulme, landscape painter; Fanny Kemble, actress; John Arrow-Smith, geographer and cartographer; Charles Albin Buckler, architect and George Borrow, author and gypsy traveller. The house on the east side, No. 133 Gloucester Road, is reputedly the house on which author Sir James Barrie based the Darling residence visited by Peter Pan, although new research in 2013 suggests that this is erroneous, and it was actually on the corner of Brunswick Square (q.v.) and Grenville Street!